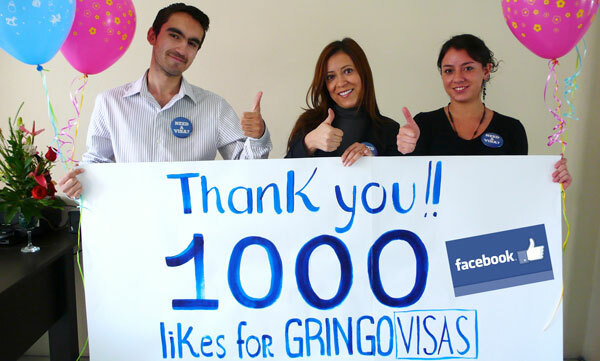 GRINGO VISAS GETS 1,000+ LIKES ON FACEBOOK 1st WEEK! Thanks to all the people who took the time to congratulate Maite on the successful launch of her new website and Facebook page Gringo Visas. Maite Duran has helped hundreds of expats obtain resident visas from around the world, and now under the name Gringo Visas will continue to specializing in visas, nothing but visas. Gringo Visas is committed to obtaining your Residency Visa in Ecuador – fast, easy and affordable by doing what we do best, nothing but Visas. Gringo Visas has a bilingual staff including in-house legal counsel with offices in Cuenca and Quito, Ecuador. Gringo Visas is the only Visa service provider in Ecuador also with an office in the United States. Contact info@https://gringovisas.com or by phone in Ecuador (593) 098 915 3622, in the United States (203) 648 4511. PreviousVISA EXPERT MAITE DURAN TALKS VISAS ON ECUADOR’S TOP EXPAT INTERNET RADIO SHOW	NextVISAS LAS VISAS!